The first lie about Yemen’s dirty war in the world of official journalism is that the fighting there has been a “nine-month conflict” and that “the conflict started in March,” as the New York Times put it on December 17. This is simply not true in any meaningful sense. What started in March was a savage, one-sided air war backed by the US, all too similar to the Nazi-backed one-sided air war in Spain in the thirties that gave the world “Guernica” . Yemen’s civil war has already lasted decades, on and off. And Yemen has an even longer history of conflict (all of which the Times knows, without letting perspective clarify its reporting). For decades at least, Yemen has suffered from chronic foreign interventions and manipulations, none of which have brought much peace to the Yemeni people, who live in one of the oldest civilized regions of the world. The illegal, brutal war that goes unspoken (except as a “nine-month conflict that started in March”) is the genocidal bombing of Yemen by Saudi Arabia and its Arab allies. This is essentially a rolling war crime of unending dimension, all supported materially, tactically, and unjustly by the US. The US is at war (the naval blockade alone is an act of war) with Yemen, on the side of the aggressors, and Congress doesn’t seem to know about it, presidential candidates fail to talk about it, the media report it little but dishonestly, and the nation stumbles on in bloody silence as its moral numbness deepens. Despite the optimism, and based on our experience, the talks won’t be easy…. We are seeking to reach peaceful solutions but the stick will remain to achieve what could not be achieved in the talks. At the same time the talks began in Switzerland, the parties had agreed to start a seven-day ceasefire in Yemen on December 15. So far, the ceasefire has held, sort of, with both sides reporting violations on the ground. The Saudi side has continued some air strikes (killing at least 15) but says Houthi violationsmay cause the talks to collapse. 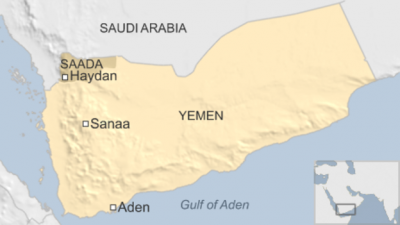 An exchange of several hundred prisoners on each side in Yemen was held up by al-Baydah tribesmen and then apparently carried out. The Houthis continue to hold members and relatives of the government-in-exile in Saudi Arabia. Saudi planes and gunboats have attacked targets in the north daily since the ceasefire began. By the time anyone reads this, the ceasefire may be over in principle as well as in fact. And Saudi Arabia says it has pledges from 34 governments to join a new Islamic coalition to fight terrorism. How many of these governments, like Saudi Arabia, rule their countries by terror? Think about it. The leader of the coalition carrying out massive terror-bombing in Yemen is going to lead another coalition in counterterrorism.